Speculation is building Biden will be named Obama's running mate. (CNN) - When Joe Biden returns to Capitol Hill Monday from his two-day trip to embattled Georgia, vice presidential speculation will rest squarely on him. The longtime Delaware senator and former presidential candidate has long been considered to be on the shortlist for Barack Obama's running mate, but his quickly-planned trip to Georgia Saturday night at the behest of that country's president left Washington buzzing he is the most likely choice. Watch: Will it be Biden? After all, the Georgia crisis appears to have put national security issues again at the forefront of the presidential campaign, and it's an issue where John McCain has long held the advantage over Obama. The Illinois senator, so the Beltway chatter goes, needs a running-mate with foreign policy experience now more than ever. If Biden does aspire to be on the Democratic presidential ticket, the trip couldn't have come at a better time - reinforcing his lengthy resume on matters of foreign policy and reminding voters, and Obama, he is well respected by foreign leaders half a world away. The trip also comes days before Obama is expected to reveal his VP choice - with only days remaining until the Democratic convention, the choice is expected to come this week. But of course Biden suggested before he left Saturday he isn't making the trip for political reasons. "I am going to Georgia this weekend to get the facts first-hand and to show my support for Georgia’s people and its democratically-elected government," he said in a statement. "I look forward to reporting to my colleagues in the Senate and on the Foreign Relations Committee, as well as the Administration, about what I learn." He may have one or two conversations with his colleague from Illinois too. If McCain wins this year you better bet that there will be a big push against the Clintons in 2012 and will be the first to sign up. The Clintons are hurting Obama right now along with their radical supporters. They better get there act together or this will be the end for Hillary. Obama has no control over Bill or Hillary and that is exactly why she cannot be the VP. They are both out of control. Great! Another white guy like me. Why is this country so afraid of putting a woman in a position of power. Other large countries have. Wake us America – it's 2008. Now we'll have to wait until 2012 to get Hillary in the White House. I guess Biden is okay. He has a big mouth, but he's a decent choice for VP candidate. I guess there is no other alternative in the democratic party. What happened to the times when Presidents, scientist and astronauts where Celebrities. Maybe we need to find those times again. I would love to see Obama/Bidden working to bring this country back to the celebrity mode it once held. A candidate with minimal political experience and a complete lack of military experience, relying on a VP (and presumably a Sec. of Def.) with substantial foreign policy experience when making military decisions...hmmm...are we talking Bush-Cheney or Obama-Biden? Biden does not mince words or trying to be cute. He is a great choice. Wouldn't put it past some of the people on here. All the marketing can't hide the real Barack, he's just not the man they say he is, he can wear what ever mask he wants, people have seen though him. What does Obama represent anyway? Being a long time democrat who has voted since President Carter's time, I find it hard to believe that I can not even force myself to vote for Obama. 2. Lack of politcal stances that one can count on. He has swung so many times in the last couple of months from saying he will do one thing and doing another. I just don't trust him. 3. His dissing of HRC and our ex-president Bill Clinton who he allowed his entire troop of followers to join in saying that he was a racist. Unbelievable lack of respect for the democrats greatest president in our lifetime. 4. DNC's rigging of having Obama nominated and I won't go into detail because Everyone knows the story. believe that us old democrats are between a rock and a hard place and that we have no choice other than voting for Obama. I think that the DNC needs to learn a lesson and lose this election and I'll just wait until the 4 years have gone by with McCain as president and see whether the democratic party has restored themselves to some semblance of sanity. I'm not alone in these thoughts, there are many many loyal democrats in this same position that I am in. It will cost Obama plenty of votes. Biden?? The plagiarist? The loud mouth? bring him on! i am shocked people are willing to allow politics play a role in winning the white house. people are stating that they will not vote if hillary is not on the ticket....that means u will allow someone who disagrees with ur belief to continue the bush-cheney yrs. 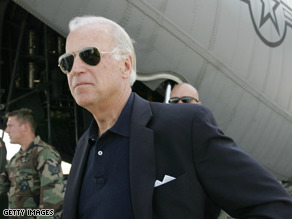 Biden is the best person on foreign policy Obama can pick. If you want America BACK people, Obama is the key. I have been a registered Republican all my life. Now I am not so sure about the policies of the Republican Party. Too bad, but now I am going to vote for the person who is for the little people because that is what most Americans are today. Not rich and priviledged like GW Bush and McCain (who's wife by the way is a multimillionaire). I just want a politician who can relate to; which bill should I pay this week (the phone or the car payment)? Do you really think the aforementioned politians know anything about how most Americans struggle? Me, I am voting for the man who has been there, and can still remember and isn't ashamed to talk about his struggles. Come on people, THINK, make a good decision! Biden is another liberal who likes to give speeches. Birds of the same feather flock together. It is a disgrace for Democratic party. Biden is the best pick. I believed Obama/Clinton would have been the dream ticket, but Clinton brings too much baggage. Because if you get Hillary, you also get Bill. Joe Biden knows how to handle the Righties, he's also very strong in foreigh affairs. With Biden, Obama can't lose! And for you Clinton supporters, your candidate ran a bad campaign get over it and stop using scapegoats to justify your defeat. This is a critical election and we can't help votes made or not made over spite. This is ridiculous, you all are old enough to vote, so start acting like grown ups, and do the responsible thing. Vote for the candidate that supports your ideas and views. Doesn’t matter who he chooses, I will still be writing in Hillary's name come November. I invite and encourage all my PUMA brothers and sisters who cannot fathom the ridiculousness of an Obama presidency to do the same. DOWN WITH OBAMA AND HIS RACIST WIFE! Obama will fail without Hillary. The unity of the Democratic Party depends on her as the VP nominee. hmm...moderation....people can bash and claim that McCain had the questions before hand but no comments to the contrary get through? He will be a good choice! Of course, I don't see how anyone McBush picks will make any real difference anyway. Wouldn't Secretary of State be a wiser decision for Biden?